Interstate 459 forms a beltway around the south side of Birmingham between I-59/20 at Bessemer and I-59 near Trussville. The freeway functions as a bypass for I-59/20 west to Tuscaloosa and Meridian, Mississippi, I-20 east to Anniston and Atlanta, Georgia and I-59 north to Gadsden and Chattanooga, Tennessee. Speed limits vary between 65 and 70 miles per hour along the mostly six-lane suburban freeway. Interstate 459 bends northwest from the diamond interchange (Exit 31) with Derby Parkway toward U.S. 11 and I-59 near Roebuck Plaza. Photo taken by Chris Patriarca (01/03/03). A lane drop occurs along northbound I-459 at Exit 32 for U.S. 11 into the city of Trussville. Two lanes proceed north into the directional T interchange (Exit 33) with Interstate 59. Photo taken by Chris Patriarca (01/03/03). Two lanes continue northward onto Interstate 59 toward Gadsden and Chattanooga, Tennessee. The left side ramp leads back into Birmingham. Photo taken by Chris Patriarca (05/19/03). Two miles north of the I-59 southbound split with Interstate 459 (Exit 137) between Red and Little Sand Mountains. Photo taken 06/25/12. The left exit for Interstate 459 south departs from I-59 south ahead of Roebuck Plaza in northeast Birmingham. The forthcoming exchange lies 12 miles northeast of Downtown Birmingham. Photo taken 06/25/12. I-459 comprises a regional bypass of Birmingham for points south along I-65 including Montgomery and west along I-59/20 including Tuscaloosa. Photo taken 06/25/12. 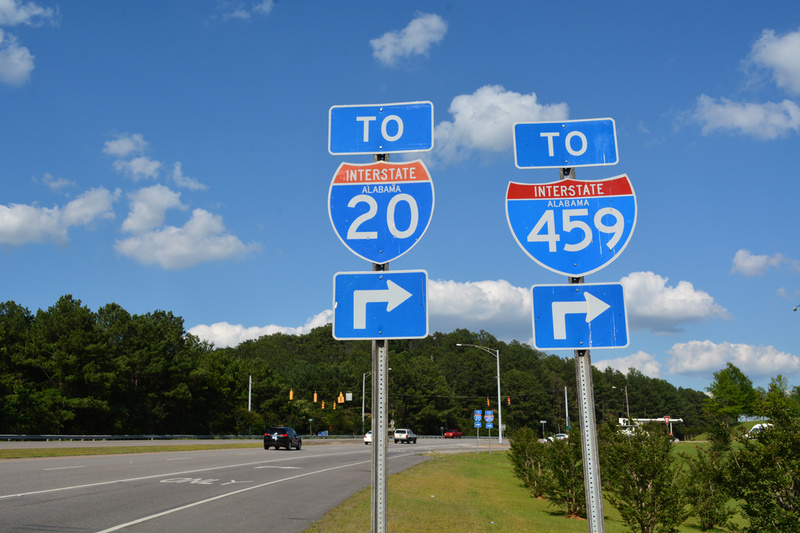 Southbound I-59 reaches left Exit 137 for Interstate 459 to Irondale, Mountanin Brook and Vestavia Hills. Photo taken 06/25/12. The first sign for the north end of Interstate 459 along I-59 northbound appears at the Valley Drive underpass and the Brookhurst community in Birmingham. Photo taken 06/09/17. Interstate 59 arcs across Red Mountain through Sadler Gap, switching sides with parallel U.S. 11 ahead of Roebuck Plaza and the three-wye interchange (Exit 137) with I-459. Photo taken 06/09/17. Button copy signs for I-459 south at Exit 137 date from 1978. Beyond Interstate 459, I-59 travels through the city of Trussville and reaches Gadsden in 50 miles. Photo taken 06/09/17. Exit 137 departs Interstate 59 north for I-459 south to Irondale, Vestavia Hills and Hoover. Flyovers between the two freeways pass over the northbound mainline ahead of Little Sand Mountain. Photo taken 06/09/17. Two miles out from the trumpet interchange joining Interstate 459 with I-59/20 at McCalla. Photo taken 06/09/17. Crossing over 4th Avenue SW, I-459 leaves the Bessmer city limits. The forthcoming exchange with I-59/20 lies 33 miles northeast of Tuscaloosa and 18 miles southwest of Downtown Birmingham. Photo taken 06/09/17. 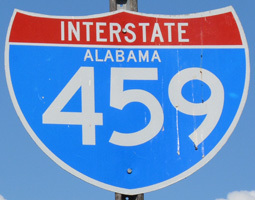 An end shield is posted for Interstate 459 southbound. Photo taken 06/09/17. Two lanes default onto Interstates 20 west & 59 south to Tuscaloosa and Meridian, Mississippi. I-20/59 north return motorists to Bessemer nearby. Photo taken 06/09/17. U.S. 11 & SR 5 combine with I-59/20 southwest from Bessemer City at the preceding interchange to Interstate 459 north (Exit 106). Photo taken 06/09/17. Original construction of I-59/20 southwest from Bessemer to the trumpet interchange (Exit 106) with Interstate 459 directly replaced the previous four lane alignment of U.S. 11 and SR 5. Photo taken 06/09/17. I-59/20 south crosses Fivemile Creek a half mile ahead of the loop ramp (Exit 106) for Interstate 459 north. I-459 travels east across Shades Valley 15 miles to the four level interchange with I-65 at Hoover. Photo taken 06/09/17. Exit 106 departs I-59/20 south, 8.4 miles from the separation of U.S. 11/SR 5 in Tuscaloosa County. Traffic from I-459 south expands the freeway to six overall lanes. Photo taken 06/09/17. One mile south of the I-59/20 separation with I-459 east. Regional traffic to Gadsden and Atlanta, Georgia is directed to take Interstate 459 around Birmingham. Photo taken 06/09/17. I-59/20 and U.S. 11/SR 5 advance northeast between McAshen Mountain and Red Ridge to Exit 106. Photo taken 06/09/17. Exit 106 departs with two lanes for Interstate 459 north to Hoover, Vestavia Hills and the northern Shelby County suburbs. PPhoto taken 06/09/17. Widening of I-59/20 from four to six lanes included the replacement of this ground level guide sign with an overhead assembly. Photo taken by Chris Patriarca (05/19/03). One mile south of Exit 106 during construction to six lane I-59/20. Photo taken by Chris Patriarca (05/19/03). “Nashville firm low bidder.” Gadsden Times (AL), January 24, 1981. “Section of I-459 may be open soon.” The Tuscaloosa News (AL), November 28, 1984.